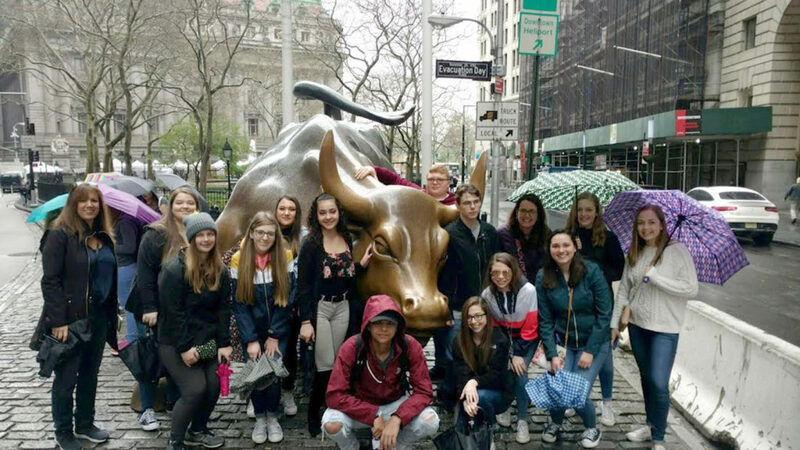 Photos Submitted Students from Dunkirk High School and Silver Creek High School participated in a field trip to New York City during a weekend in April. Pictured above, students from the trip pose for a couple shots during their tour of the city. On April 26 Dunkirk and Silver Creek High School students attended a weekend field trip to New York City. Participants of the trip included members of DHS FBLA Club (Future Business Leaders of America) along with students currently enrolled in business courses. The first day in Manhattan started with a tour of NYC’s Financial District (Wall Street) and the history behind iconic sculptures such as the Charging Bull. They then ventured to Carlo’s Bakery in Hoboken, New Jersey, to sample the delicious desserts of the famous Buddy Valastro from the TLC show ‘Cake Boss’. The next stop was Ground Zero where they visited the recently constructed 9/11 Memorial Fountains. They also toured St. Paul’s Church that was temporarily converted into a refueling station for workers during the 9/11 rescue and recovery attempts. “I loved learning more about the 9/11 rescue efforts and visiting the site that is a significant part of our history”, said Savanna Dawley. The second day in the city began with a tour of Grand Central Station. Students rode the subway from Battery Park to Grand Central where they were able to see the hub of all subways and trains that enter and exit from the city. Afterwards, they headed over to NBC Studios for a tour of their facilities. Here they learned how the news gets from the studios to your home. The students were able to tour the studio sets of Saturday Night Live and The Tonight Show Starring Jimmy Fallon. The NBC Studio tour ended with an interactive segment where the students were the stars of their own show. The show was taped and sent to their emails for viewing. The remainder of the day was spent touring Central Park, 5th Avenue sites (such as Trump Towers, St. Patrick’s Cathedral, and The Plaza Hotel). After enjoying a family-style Italian dinner in the heart of Times Square, students were entertained by street performers, the technology screens and lights that line Broadway, along with a little shopping. “Overall it was really fun, I learned a lot, and would love to go back again,” said Julia Bennett.